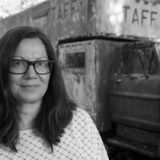 Join us to celebrate the completion of Stacy Szymaszek‘s verse journal trilogy, begun in 2015 with hart island (Nightboat), continuing through Journal of Ugly Sites and Other Journals (Fence, 2016), and now concluding with her latest A Year From Today (Nightboat, 2018). Through these texts, Szymaszek explores the internal and external, the spaces between, feeling and memory, working, writing, and making a life. Stacy will be joined by Brenda Coultas, Renee Gladman, and Bernadette Mayer, who will each read from their own work. Brenda Coultas is the author of The Tatters, a collection of poetry, published by Wesleyan University Press. Her other books include The Marvelous Bones of Time (2008) and A Handmade Museum (2003) from Coffee House Press. 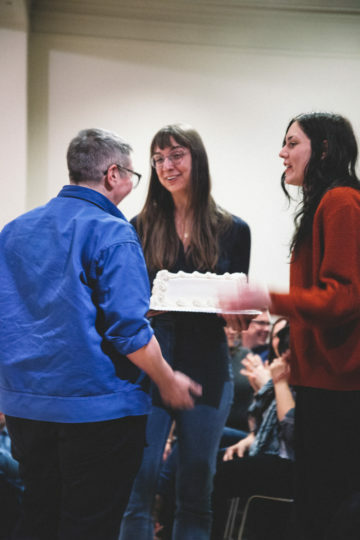 This past November, Coultas was the featured blogger for Harriet at the Poetry Foundation. 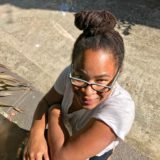 Renee Gladman is a writer and artist preoccupied with lines, crossings, thresholds, and geographies as they play out in the interstices of poetry and prose. She is the author of eleven published works, including a cycle of novels about the city-state Ravicka and its inhabitants, the Ravickians—Event Factory (2010), The Ravickians (2011), Ana Patova Crosses a Bridge (2013), and Houses of Ravicka (2017)—as well as Calamities, a collection of linked auto-essays on the intersections of writing, drawing, and community, which won the 2017 CLMP Firecracker Award for Creative Non-Fiction, and two monographs of drawings: Prose Architectures (2017) and One Long Black Sentence (forthcoming fall 2019). Recent essays and visual work have appeared in The Paris Review, Gulf Coast, Granta, Harper’s, BOMB magazine, and n+1. She has been awarded fellowships, artist grants, and residencies from the Radcliffe Institute for Advanced Study at Harvard, Foundation for Contemporary Arts, and the Lannan Foundation, among others. For 2019, she is Writer-in-Residence at KW Institute for Contemporary Art in Berlin. 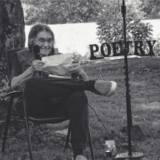 Bernadette Mayer‘s collections of poetry include Midwinter Day (1982, 1999), A Bernadette Mayer Reader (1992), The Desire of Mothers to Please Others in Letters (1994), Another Smashed Pinecone (1998), Poetry State Forest (2008), and Works and Days (2016), which was a National Book Critics Circle Award finalist. Mayer served as director of The Poetry Project from 1980-1984. Stacy Szymaszek is a poet, and arts administrator/organizer, and teacher. She was born in Milwaukee, Wisconsin where in 1999 she started working for Woodland Pattern Book Center. She founded and edited seven issues of GAM, a free magazine featuring the work of poets living in the upper midwest. In 2005, she moved to NYC to work for The Poetry Project at St. Mark’s Church, where she served as Executive Director from 2007-2018. 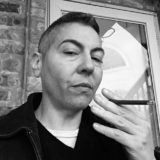 Szymaszek is the author of the books Emptied of All Ships (2005), Hyperglossia (2009), hart island (2015), Journal of Ugly Sites and Other Journals (2016), which won the Ottoline Prize from Fence Books and was nominated for a Lambda Literary Award in 2017, and A Year From Today (2018 ). She is the recipient of a 2014 New York Foundation for the Arts Fellowship in Poetry and a 2019 Foundation for Contemporary Arts award in poetry. She is a regular teacher for Naropa University’s Summer Writing Program, and mentor for Queer Art Mentorship. Szymaszek is the 2018-19 Hugo Visiting Writer at the University of Montana and was a Poet-in-Resident at Brown University in fall 2018.